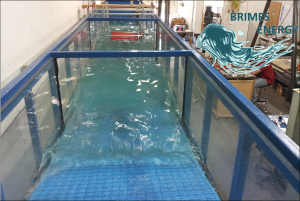 Brimes Energy has its own wave flume which is designed and built in-house. It can produce up to 10″ wave height and has the size of 48″ by 40′ with the capacity of 5000 Gallon. The wave generator is controlled by a 7.5 KW servo.